Looking for a heart-healthy, low-cal entree that doesn't skimp on flavor? This Broiled Tilapia with Avocado Salsa recipe delivers. 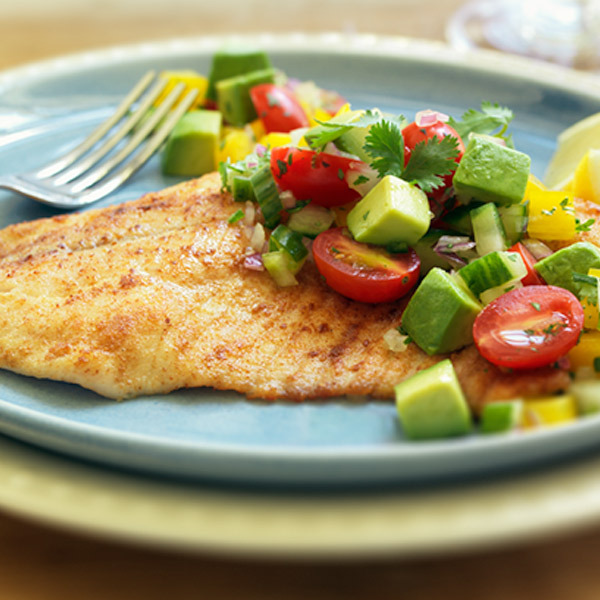 Tilapia fillets are rubbed with olive oil and coriander, broiled, and served with our colorful, chunky avocado salsa. Made with Hass avocados, yellow bell peppers, grape tomatoes, cilantro and jalapeños, this quick and delicious avocado salsa is a versatile accompaniment to a variety of fish dishes. This easy recipe makes great fish tacos, too! In medium bowl, stir together bell pepper, tomatoes, cucumber, onion, cilantro, lemon juice, jalapeño and 1 teaspoon salt. Add avocados and toss gently to combine. Refrigerate salsa until ready to use. Preheat broiler. Rub tilapia with oil; then sprinkle with coriander and remaining ¾ teaspoon salt. Broil 4 inches from heat 5 to 6 minutes until fish just flakes when tested with fork. Serve fish topped with salsa and garnished with lemon wedges.